One of Kashmir’s many realities and sub-realities is that social media has become a new battleground for competing and conflicting narratives or for testing various ideals. In a recent example, a father-son duo from Srinagar took to social media for contradictory purposes. In a first, an emotionally broken parent Naeem Fazili utilised his Facebook timeline to make a passionate call to his son Mohammad Eisa Fazili, who recently joined the ranks of the armed rebels, to return to the family. It isn't rare for those who support Kashmir’s struggle for the right to self-determination and are either sympathisers of the pro-independence or pro-Pakistan camps to use online platforms like Twitter, Facebook and Instagram to counter what they describe as “a pro-India narrative on Kashmir” promoted officially by pro-India political parties, government spokespersons, the Army and the Jammu and Kashmir police department among others. Since then, the post has been taken off from Facebook, but Catch managed to get a screen grab of the emotional appeal. According to police sources, Eisa is an engineering student who recently left his studies to join the ranks of an extremist militant group. 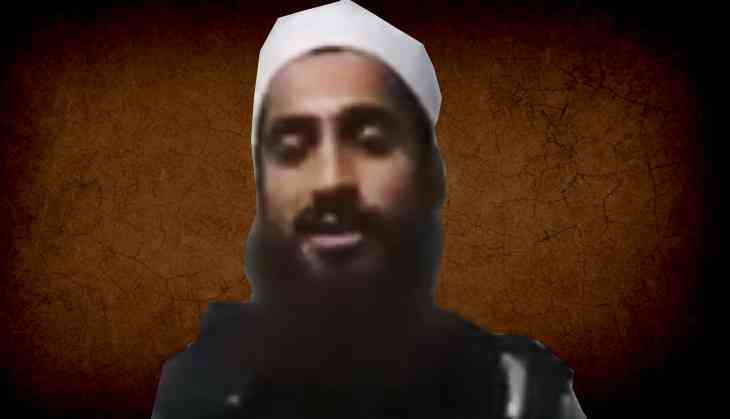 Police sources suspect that Eisa may have joined the Ansar Ghazwat-ul-Hind, a radical outfit which calls for jihad to establish the Caliphate in Kashmir. Fazili’s son is a resident of Shadab colony in Soura, Srinagar. Eisa went missing from his hostel room in Baba Ghulam Shah Badshah University (BGSBU) in Rajouri on 17 August. A few days before Eid-ul-Azha, he passionately talked about jihad while quoting specific verses from the holy book in an 8 minute and 24 second-long video. In the video, Eisa, sporting beard and wearing a white-colour skullcap, is seen with an assault rifle. He begins his video message by reciting Quranic verses (38 and 39) from Surah At-Tawbah in Arabic. After Arabic, Eisa switches to Urdu to read: “Maslihat ki niqaabein utaaro bhi ab, kufr ko kufr kehkar pukaro bhi ab…” (Remove the masks of expediency, to describe infidelity [kufr] as kufr). This, he says, could only be achieved through “jihad fee sabeelillah” (the holy struggle for Allah’s sake). In what could well be a major shift in Kashmir’s 27-year old armed militancy, Eisa like Zakir talks about problems faced by Muslims in Iraq, Yemen, Syria, Palestine, Pakistan, Kashmir and Burma (formerly Myanmar). “Only over the last three days, nearly three thousand Muslims have been mercilessly martyred in Burma,” Eisa says, while highlighting the plight of Muslims around the globe. “I appeal to the young Muslims, irrespective of their professions as engineers or doctors, to play a constructive role to help the Burmese (Rohingya) Muslims,” he adds. In the later part of his video message, he explains the reasons behind his becoming an armed rebel. “I was not fed up with society, worldly affairs or my engineering studies in the college. Only after seeing the abject condition of Muslim Ummah did I choose to tread the path of Jihad in the name of Allah for Allah’s sake,” he concludes, with a message of Zarqawi about how to celebrate Eid. 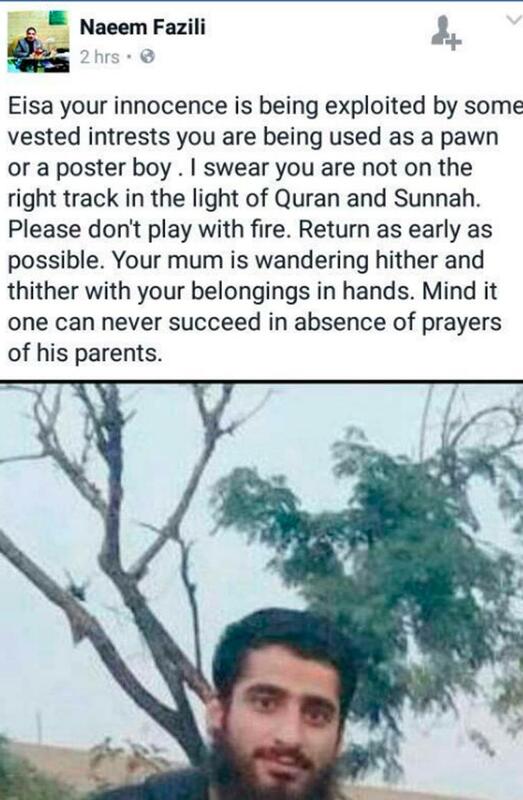 Because of fanatic content in his message, the police suspected that Eisa may have joined the extremist group Ansar Ghazwat-ul-Hind, which is headed by Zakir Rashid Bhat alias Musa. Not long ago, Musa had parted ways with the pro-Pakistan militant group, Hizb-ul-Mujahideen. Speaking to Catch on phone, Yougal Manhas, the senior superintendent of Jammu and Kashmir police, Rajouri, confirmed that Eisa had joined the ranks of Zakir-led group. “We are pretty sure that he (Eisa) has joined the ranks of Zakir,” Manhas said. Eisa is the fifth militant from Srinagar district, a top source in police’s counterinsurgency wing told Catch. “Before Eisa, we have specific information about boys like Mugais from Parimpora, Danish (HMT), Fayaz (Khanqah-e-Sokhta) and Mehraj-ud-Din Bangroo (Fateh Kadal) joining the militant group Lashkar-e-Toiba (LeT),” said a senior police officer. Another source in police’s intelligence wing told Catch that Eisa may actually be the sixth militant from Srinagar, which had earlier been described as a “militancy-free district”. He said that the sixth militant is somewhere from Harwan. It is suspected that when Eisa went home for a two-month holiday, he came in contact with the armed militants.